Children traditionally wear white and carry rosaries for First Holy Communion. First Holy Communion is a joyful event in the spiritual life of a Catholic child. 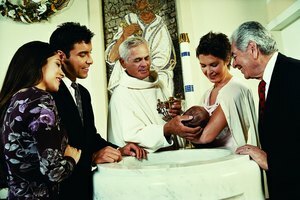 The sacrament is one of the three sacraments of Christian initiation: Baptism, Confirmation and the Eucharist. First Holy Communion introduces the child to a practice that reaffirms a belief in eternal life. Celebrations are customary and you may receive an invitation to a party or a formal announcement of the ritual ceremony. Heartfelt congratulations are in order and gift-giving should acknowledge both the joy and the solemnity of the sacrament. First Holy Communion is a milestone for a young Catholic. The rite is one of seven sacraments of the Catholic Church and represents initiation into the participatory community of the faithful: the sharing of the blessed wafer and wine that a priest transforms into the body and blood of Jesus Christ. Believers accept this transformation as both symbolic and real -- at the Last Supper, Christ broke bread and offered wine to the apostles, telling them to eat and drink of his body and blood. Since then, Catholic priests have blessed flat wafers and a chalice of wine in the Mass, changing them into the body and blood of the savior who gave up his life to earn eternal life for his followers. At about age seven, the age of reason, Catholic children study their catechism and prepare to receive the sacrament at Mass for the first time. First Holy Communion, or Holy Eucharist, is a celebratory occasion, attended in church by friends and family and typically followed by a party to honor the new communicant. Children wear white clothing to symbolize purity and may carry small prayer books or rosary beads. It is customary, but not required, to give a present or token of remembrance for the occasion. 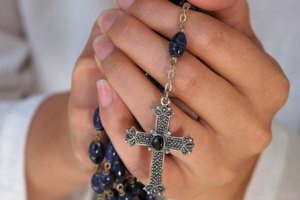 One gift that honors the religious nature of the event is a small rosary -- the string of beads and crucifix upon which a series of Lord's Prayers and Hail Marys are recited. 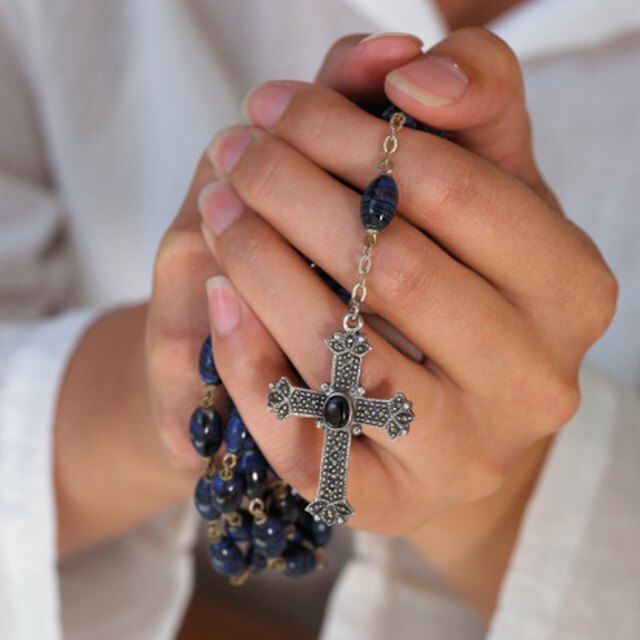 Fine rosaries are made of silver beads, crystals or pearls but a simple white rosary of glass beads or resin is fine. Child-size missals are appropriate gifts. A missal is a book of the collected prayers and responses used in celebration of the Catholic Mass. A religious medal of the child's feast-day saint or the Virgin Mary, worn as a necklace, is a spiritual reminder of the day and may be blessed by a priest to confer protection. When religious gifts are covered by immediate family, a secular present commemorates the event. Flowers are festive -- white flowers such as sweetheart roses, lilies of the valley, daisies and carnations make charming nosegays or bouquets. Books work equally well for girls or boys -- a child's version of the lives of the saints, a biography of the saint the child is drawn to or named for, or a quality children's classic would make an appropriate gift. Cash or a gift card, after consultation with the parents, could buy something the child needs or wants, or go into a savings account. A contribution to the expense of outfitting the child for the service -- paying for a fancy dress, veil, white suit or shoes -- can be enjoyed by both child and parents. 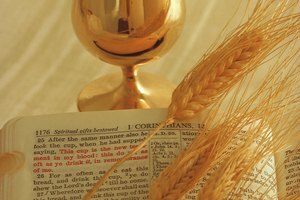 Adults who convert to Catholicism are introduced to the sacraments in small study groups or individually as they complete their instruction in the practices of the faith. You may be informed of or invited to the Mass in which the convert receives the Eucharist for the first time, and there may or may not be a celebration. A gift for a close friend or family member is thoughtful and may be religious or secular. A fine rosary, Bible, or blessed medal acknowledge the spiritual nature of the commitment. Flowers or a flowering plant, like a white orchid, are good party gifts. A religious biography, statue of a favorite saint for a home altar, or book of poetry could inspire reflection. Gerard Manley Hopkins is an accessible, ecstatic Catholic poet. Mary Oliver's poetry explores the sublime in nature. In general, whatever is meaningful to the recipient and honors this significant rite of passage in the faith will fit the occasion. Crawford, Benna. "What Kind of Present Do You Give for First Holy Communion?" Synonym, https://classroom.synonym.com/what-kind-of-present-do-you-give-for-first-holy-communion-12084942.html. 29 September 2017.